Where is the hopeful sci-fi? I thought about it for a while and realized that much of sci-fi—probably most of it—wouldn’t pass her test. It also occurred to me that one reader’s hopeful future is another’s dystopia. For example, one of the first writers I would propose for the list of hopeful science fiction would be Arthur C. Clarke. It’s true that there are aliens in most of Clarke’s work—at least the books and stories I’ve read—but Clarke’s vision of humanity’s future is progressive, expansive, and I would argue millenarian. Clarke’s basic thesis in 2001, Rendevous with Rama, Fountains of Paradise, and elsewhere is that humans are destined to take to the stars, to become ever more technologically advanced, to live ultimately as gods (that is, as creatures that would seem godlike to us by today’s standards). I find the idea appealing—I’m basically a Teilhardian-style Christian—but I know that Clarke’s technophilia is a turn-off to some readers. Does hopeful sci-fi depend on our building space elevators and then Dyson spheres and ultimately leaving behind our earthly bodies entirely? As a corrective, I would also suggest the example of Ursula Le Guin. Much of her work is just as dystopian as it is utopian, but I can think of several works in her Hainish series that portray something like a hopeful vision for humanity. The Left Hand of Darkness portrays a world which, for all of its troubles, features well-adapted human societies (or at least one of them) striving to deepen their inner lives rather than trying to build bigger, more effective guns. The enemy in the book—like the enemy in most of Clarke’s work—is ignorance rather than an alien or human invader. There are other examples, but those two jump to mind first. 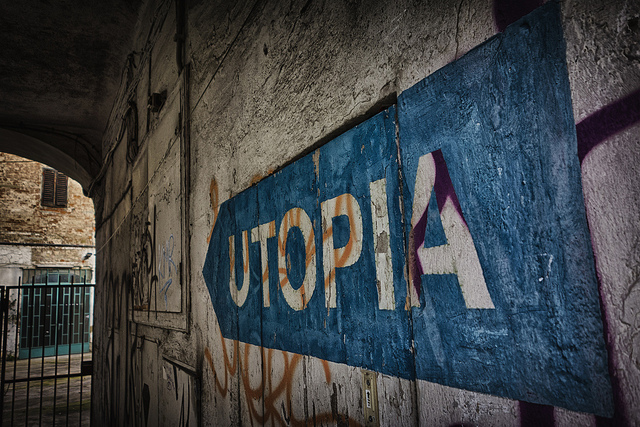 Later, I’d like to unpack why we seem so enamored of dystopian fiction, especially lately. But for now, what books, stories, movies, or games would pass my friend’s test? Where is the hopeful sci-fi?